Crib Soothers are a great way to improve sleep, helping infants to drift off more easily, or soothe them back to sleep if they wake up during the night. It goes without saying that sleep is extremely important for people, especially developing infants who need to rest and digest their day of learning. Providing your baby with a good nights sleep will ensure they are ready for another day of discovery and will help give everyone else in the home a good night sleep free from crying. There’s a good range of baby crib soothers available, sporting many variations, qualities, prices, and functions. For example, some sit on the bedside table and project images onto the ceiling whilst others hang on the bars of the crib and glow warmly. Therefore it’s quite important to get a good idea of what’s on offer so that you can decide what the best baby crib soother is for your infant. In this post, we have reviewed some of the best crib soothers on offer and considered price, size, lighting, design and a range of other features. If you have a look at the products we have tested and reviewed below, you’ll find that there is indeed a wonderfully creative variety of crib soothers and the products we selected are only the tip of the iceberg. Its very much worth taking note of our comparisons but also having a shop around yourself after you have armed yourself with the knowledge that this guide aims to provide. The first crib soother we’re looking at is from the well-recognized brand Fisher-Price; a brand well known for its robust, creative and high-quality children’s toys. Their Calming Seas Projection Soother follows in the same vein as it really was designed with sweet dreams in mind. It has such a sweet aquatic display with friendly sea creatures bobbing up and down as they rotate around the display, giving a charming feeling of weightlessness; easy for a child to fall asleep to. There is a choice between white noise, nature sounds, and music which can amazingly last for up to 60 minutes to ensure your child is most likely to have fallen asleep before any need to come into the room and reset the toy arrives. There is also an amazing projected display featured by this product which flows around the ceiling and walls with soft blue/green light invoking the feeling of the ocean and being underwater. It’s really nice and would serve to soothe an agitated or crying baby by taking their mind off the issue and holding their attention until they nod off. This first example of a crib soother we have chosen is an example of the type which does not fix onto the bars of the crib, nor is it soft and huggable therefor it would need to be placed near the crib. This means for this product you will probably need to make some space for it. It also takes 4 C batteries which are not included, these batteries can be quite expensive so I’m sure you’ll be relieved to know that they last forever in this toy. For a functional and convenient approach, the Baby Einstein Sea Dreams Soother is a perfect choice. It can either be strapped onto the bars of the crib or placed on a crib-side table and it also comes with a remote control for your ease of use. This crib soother; like the last, also has a positively cute looking underwater theme with characters such as the happy crab and the snorkeling turtle. It’s characters like these who really inspire a child imagination whilst making the baby feel they are in a loving environment which helps the child get used to sleeping in a room on their own. When the soother is hanging from the crib bars, the baby is able to interact with it themselves when they are approaching about 18 months old. The chirpy starfish character is a button that activates the toy when pressed. There are four different modes on this toy: melodies + lights + motion, melodies only, ocean sounds + lights + motion and ocean sounds only. You can choose between these modes depending on what you find works best for the baby, the music, lights and sounds gradually fade every ten minutes to help drift the baby into slumber. This marvelous owl is certainly a soother toy with an approachable and wise personality that’s also portable and can be strapped to the crib bars, fitted to a stroller, carried with the child to other locations, great for the baby to be able to have their musical friend outside of the crib and with them as company on large car journeys. The sleep owl has a large repertoire of 10 soothing songs including the playful baa-baa black sheep and the sophisticated Minuet by Luigi Boccherini as well as other sounds of nature. It also features a comforting nightlight for the baby, it’s not as impressive a display as an underwater adventure or ceiling projections but some babies find this overwhelming; the light of this owl is as warming as candlelight and will definitely assist the baby in falling asleep. Being such a great character and having such a portable design, this is a very good value for money toy in general but as far as crib soothers go, it’s not the best out there in regards to range in function, sound quality and features, however, it is a great affordable option of soother and would make a fantastic gift to a very young child. A fantastical display of midnight at the pond is on offer with this Pond Symphony crib soother which also has a nice advantage over others like itself on the market: it has soft edges! Most soothers which strap onto the crib bars are made from hard plastic but this is a great consideration of safety as well as a lovely baby toy. The music, nature noises, and lights are pleasantly soft and dim; as night time is supposed to be, helping the child associate these concepts as they develop is helpful for encouraging healthy sleeping patterns in later life. The toy also encourages interaction; the baby can activate the toy with the fluffy ladybug shaped button and the display screen is soft and durable. This soother (like others) allows you to choose between music and nature sounds whilst also allowing you to choose between the modes of music only, lights only or both. You also have the ability to connect the device to a smartphone by MP3 jack to have your own mp3’s played through the toy with the lights responding to the beat. There’s also an auto shut off button which allows you to choose how long the device stays on for before it shuts down so that you can personalize the device and conserve battery life. The Halo Snoozypod is an amazing device which helps the baby drift off to sleep with relaxing vibrations sent through the mattress. This product is not as friendly as other soothers on the market, and it is not meant to be interacted with by the child but however, it is effective at what it sets out to do and does make a luxurious bedtime! The Snoozypod can be set to vibrate for 30 minutes, during the course of that 30 minutes the vibration gradually diminishes to not wake the child upon stopping. Ir can also be set to vibrate all night long which is handy and it is up to you which is more effective on your baby. 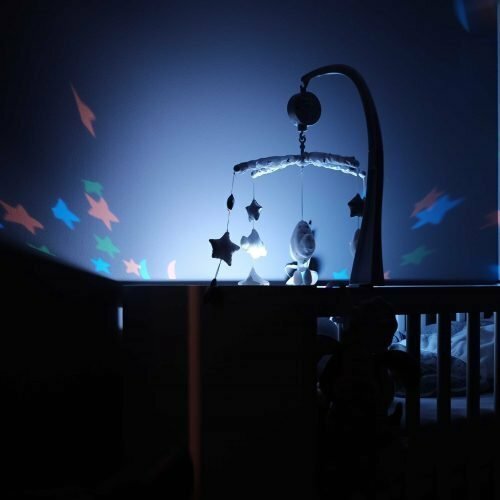 There is a very gentle nightlight that runs for half an hour that can be used to see the controls and also adds to the calming atmosphere that the vibrations produce aiding to lull your child softly to sleep. There are certainly some things you will probably want to think about when making a purchase for your baby. Concerns such as safety, space and price are just some of the things your questions are likely going to relate to. When it comes to safety, removable and moving parts may by be an issue for some products and so it’s definitely something to watch out for. The materials in the baby products featured in the reviews below are all non-toxic and child-friendly. Space conservation is not usually a great concern with these toys. Some do not attach to the bars of the crib and are free-standing, stuffed toys with music and lights functions which are great for the child to hug and play with. Other products are not as soft and wouldn’t be as good in the crib with the child and would be better put on a table near the crib and so if you haven’t got the space for that option, it’s best to stick to either attaching to the crib bars or having a soft toy in the crib that your baby can interact with. The actual price of the crib soother is no doubt going to be the main factor affecting your decision to purchase or not, and most of the time this would depend on the quality of the item. The value of the item comes into whether it has the functions that you want whilst being a competitive price on the market and so our reviews will act as a fantastic guide to the options out there. Other Concerns you may have; including style and convenience will be completely subjective and dictated by your situation. The best baby crib soothers have convenience in mind, some featuring a remote control for ease of use and parental control, well worth looking into as this feature would allow you to control the toy without entering the room and disturbing the child. Just as a finisher for this guide I would like to encourage you again to really delve into the soothers on the market now you have more of an idea what to expect and the differentiation between these products. Those reviewed may not be the soother you want but the best baby crib soother for you and your baby may be just a click away.